A SECTARIAN killer who boasted that he had no problem killing Catholics, a loyalist drug dealer that brought death and despair to his own community, an extortionist who traded in fear for money – there will be few to mourn the death of former ‘UDA Brigadier’ Ihab Shoukri. And for some, particularly those whose sons and daughters fell victim to the UDA’s drug-peddling empire, the fact that Ihab Shoukri’s death was drug induced will be a bitter irony. Shoukri died of asphyxiation after taking a fit induced by prolonged and excessive drug use on the evening of his death, most probably a cocktail of a heroin substitute and cocaine. On Saturday, 22 November, Ihab was watching televised boxing at the home of another prominent loyalist. He had taken a heroin substitute before, later, repeatedly snorting cocaine. He is believed to have died during a convulsion. As notorious as London’s Kray Twins, the Shoukri brothers, Ihab and Andre, rose to prominence within the UDA as part of a new wave of loyalist paramilitaries whose notoriety as sectarian killers enhanced their status within loyalist circles. In 2002, Ihab Shoukri replaced his brother as leader of the UDA in north Belfast after Andre was jailed. It was a year of escalating loyalist violence: during a three-month period over the summer, there were over 350 attacks against Catholics, including 144 bomb attacks, 25 shooting incidents, 151 homes damaged, 49 people assaulted and one killing. Many of these attacks took place in north Belfast, where rivalry between different UDA factions was played out in sectarian violence. The Shoukris had established their sectarian credentials at an early age after Andre, then a teenager, attacked a young Catholic tennis player, Gareth Parker. As Gareth was being beaten, he fell into the path of an oncoming car. He died of his injuries a short time later. The cynicism with which these young killers viewed sectarian murder was betrayed by Ihab during a media interview. Ihab told a journalist that Johnny Adair was “running around killing Catholics” but was apparently immune from being arrested. “Now don’t get me wrong, I’ve no problem killing Catholics but the problem is every time Johnny Adair kills a Catholic, three or four of my men are off the streets,” said Ihab. Ihab was undermining the ‘status’ enjoyed by a rival loyalist on the basis of being a serial sectarian killer by implying Adair was working for Special Branch, one of the ‘protected species’ who could, literally, get away with murder. 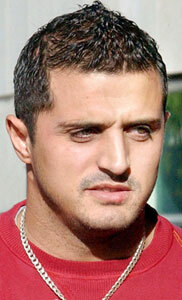 In 2003, Ihab Shoukri was implicated in the killing of 21-year-old Alan Buckley. An associate of Adair who had been ‘in exile’ in England, Buckley had been promised safe passage to visit his family on the Shankill Road. He was taken from his mother’s home by Ihab and another prominent UDA leader. Buckley was never seen alive again. His body was discovered in a shallow grave just over a week later. In March 2006, Ihab Shoukri was arrested during a raid on a north Belfast bar where UDA members were preparing for a show of strength. He pleaded guilty to UDA membership but was released within weeks into a 15-month sentence. While killing Catholics was the currency of status within unionist paramilitary circles, criminality funded their lifestyles. Andre once described joining the UDA as “a licence to print money”. In fact, it was a licence to extort money. Drug dealing, blackmail and racketeering have always been a part of the UDA but the problem with the Shoukri brothers was they flaunted it. Worse still, Andre had gambled away hundreds of thousands of pounds of community funding that had been earmarked for the coffers of the UDA. In August 2006, the Shoukris set up their own faction after they were expelled from the mainstream UDA. In November 2007, Ihab took over leadership of the faction after Andre was jailed for nine years for blackmail, intimidation and money laundering. Excess and addiction were the hallmark of both brothers: for Andre it was gambling; for Ihab it was drugs. It was widely known that Ihab was a habitual drug user. Even in jail, Ihab Shoukri spent most of his time in a drug-induced haze.